One of the neat things about wearing and collecting watches are some of the customizations that is easily done to a watch without requiring the skills of a watchmaker. Perhaps the easiest is replacing the strap with one that might be more comfortable, better suited to the elements of a particular outing, or just to change the look of the watch without having to purchase a new one. Sometimes pre-owned watches have a watch strap that is pretty beat, but the watch itself is fine. Replacing the strap with a different one is considered fine as long as the band fits the style of the watch. For example, one would not fit a dress watch that was initially fitted with a leather band with a rubber diving band designed for an all plastic watch head. One the other hand, some of the heavier stainless sport watches fit better with either a silicon rubber strap or a nylon watch strap, especially in warmer climates where the wrist changes sizes throughout the day. Three of the most popular straps to use are the Nylon NATO strap, the leather Panerai style strap, and silicon rubber watch straps. Each have their own pluses and minuses. Nylon straps were designed in the mid-60 as a simple but strong watch strap to used for military grade watches that did not have removable springbars. The springbars in military watches were not removable, so a nylon strap was necessary to snake its way through the springbars, behind the caseback of the watch, and through the other springbar. Because the watch head would sometimes slip around the strap when worn, another strap was added to keep the watchhead from moving. The great things about these straps are that they are relatively inexpensive, easy to change, are available in a variety of colors, and can be easily adjusted and the slightly expand/contract with heat. The disadvantages are that they do get a tired look after some months of daily use, and they keep the springbar exposed whereby a hit in the right place can dislodge the springbar. Fortunately with NATO straps, if a springbar fails, the watch is still attached by the other springbar because the strap is a continuous bracelet that is contiguous under the watch head. One of the cool things about Panerai watches are that they are designed for thick leather watch straps that are intended to be changed. Panerai style straps are available from a variety of makers who specialize in Panerai straps. Because Panerai uses a solid springbar to hold the strap, changing straps is easy utilizing a small screwdriver to disconnect the springbar. In this case, the springbar is a misnomer as there really is no spring, just a bar that is easily removed. There are Panerai style straps available for watch heads that use springbars, but just be sure to get a strap that is not too thick as it would look mismatched relative to the size of the watch head. These leather straps do require some maintenance with leather care cream, especially after getting wet. The advantage though is that a slightly weathered leather strap brings a warm, antique, dignified flavor to a large sports watch. Also, a thick leather band will over time conform to the wearers wrist bringing an even more custom modification to the watch. Silicon Rubber straps come is a variety of qualities and sizes. Silicon straps are extremely comfortable, but the cheap ones are prone to breakage with wear and sunlight. Good silicon straps are more expensive, but are vulcanized and are stronger, less prone to stretch, and last longer. Over time a good rubber strap will conform to the wrist like leather straps, and they come in a variety of colors like the NATO straps. 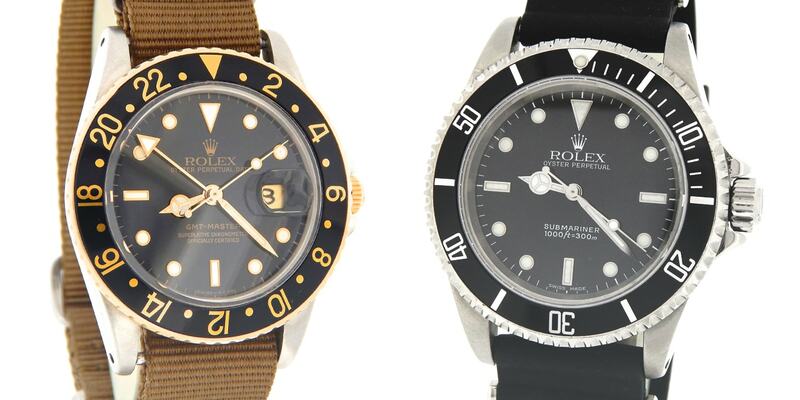 There are more manufacturers making straps for particular watch brands such as rolex and Omega. Straps made specifically for these watches look like they came from the manufacturer because they fit the watch head precisely making the customization appear that the watch was never customized. Rubber straps are easy to service (just keep them clean) and install. So, tired of looking at your watch, just replace the strap and you will get an entirely different feel, look, and experience that a new watch brings at little cost.